(HARLINGEN) – Cecilia Cuellar is studying Agricultural Technology at Texas State Technical College. The 21-year-old expects to earn her associate degree in Spring 2019, holds a perfect 4.0 grade-point average and is an active member of the Agriculture Club. 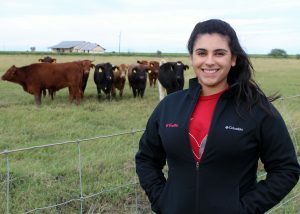 The Santa Monica, Texas native said her passion for agriculture came from watching her grandfather and father work with cattle. Growing up around the industry, she said she wants to follow in their footsteps. After I graduate from TSTC I plan on transferring to Texas A&M Kingsville to pursue a bachelor’s degree in Agricultural Science. My dream job is to work a federal job perhaps with the U.S. Department of Agriculture under the Animal and Plant Health Inspection Service conducting fever tick research. My greatest accomplishment so far at TSTC has been earning a spot on the Chancellor’s Honor Roll list. The greatest lesson I have learned is to not doubt my abilities. If you set your mind to something and work hard, then you can accomplish any goal you set for yourself. Who at TSTC has had a great influence on your success? It’s difficult to name just one person, so I’m going to have to say that all of my instructors have influenced my success. They ensure that we understand all of our lectures and labs and go the extra mile to help us. They share their experiences and always show genuine care about our success. My advice for future TSTC students is to come into college with an open mind. There are so many career choices, but it’s important that they choose what is best for them and what they’re passionate about. This entry was posted in Harlingen on November 26, 2018 by Amanda Sotelo Sotelo.